Can I delete or unlink pro/Program in Creo 2.0? Is there a way to delete a pro/Program file or unlink it to the assembly I am working on? We used to have a User here who used it for everything and he has been gone for years and his program files are no longer vaild. I have edited the embedded pro/Program file in my assembly by deleting every single line of code in it one-by-one ( You cannot perform mass highlight and delete as in Windows), saving the file and performing a regen, but the initial program file keeps loading. 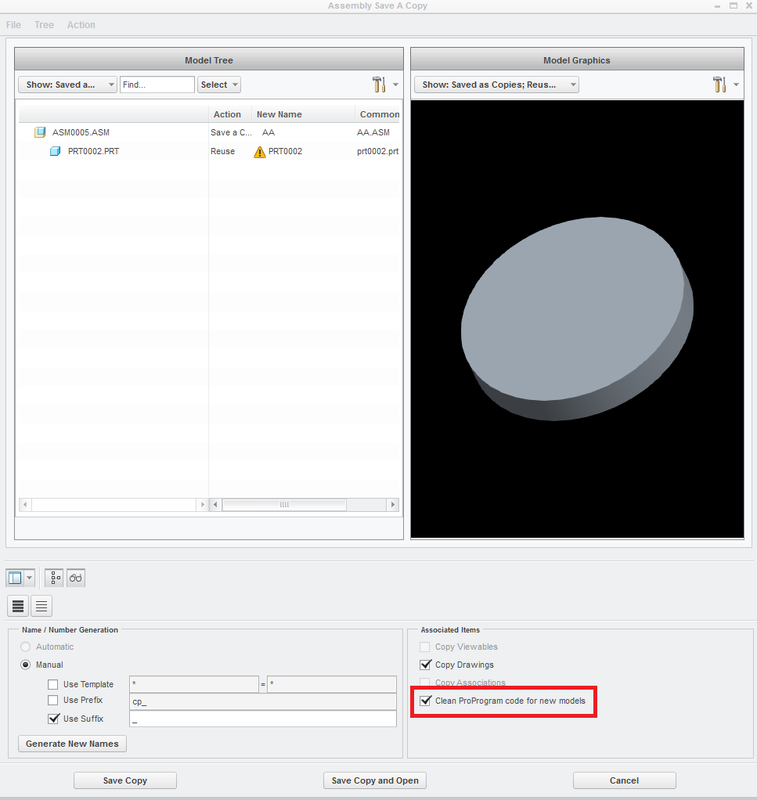 Re: Can I delete or unlink pro/Program in Creo 2.0? You can't get rid of a Pro/Program because Pro/Program is a text version of the family tree and is part of the model. If there is something the assembly is doing you don't like, and you think it has something to do with Pro/Program, post the symptoms. There is a config option for choice of editor and you can use Notepad, which will allow cutting, pasting, and so on. There are some interesting things one can do with the text version. If you select an ADD ... END ADD group of lines you can cut them and paste them elsewhere and the model tree will update to show the change. If you already have multiple instances in memory, you can perform a search and replace in the Pro/Program file to replace one instance with another from the same generic. Since you were talking just about assembly you can simply save as your assembly a check box "Clean ProProgram codes from new models"
In Part you can Edit Pro/Program a simply clear everything between INPUT and END INPUT and save it. if you can upload your part file, then somebody can repair it.